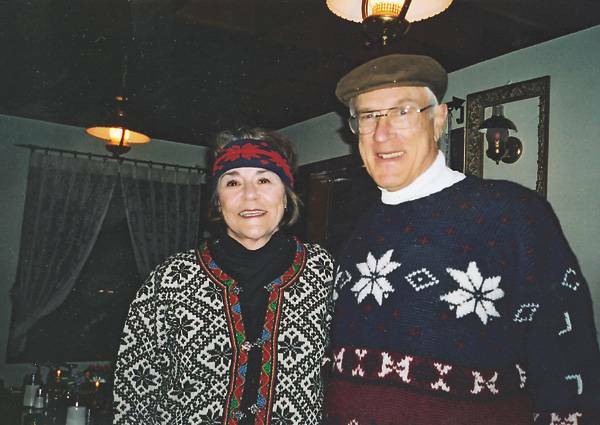 Nettie and George Heinz had some of the best old ski sweaters at the Skiers Chalet end-of-an-era party. MEH photo. 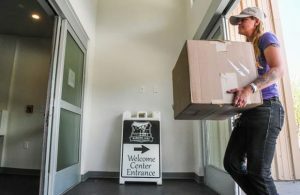 It was a sad day in Aspen when Stephen Wright announced that his lease on the Skiers Chalet was up and the restaurant will close to make room for condominiums. To commemorate the end of an era, Nancy and Guy Alciatore gave a dinner party in the restaurant and asked everyone to wear vintage ski clothing. Most everyone had an old ski sweater or knickers or baggy ski pants … and for those who didn’t, Vintage Ski World Shop on Cooper Avenue rented outfits. I wore a wonderful ski sweater that was hand-knit for me Christmas 1952 by my roommate, Aspen schoolteacher Loretta Coffman Thorpe. Skiing is what everyone is talking about … whether skiing years ago or skiing today.Helga Matuska and Jack Crawford led their annual European ski trip accompanied by Aspenites Ruth and Dave Hoff, Sandy Herron, Jack Cronin, Janis Nark, Richard Auhll, David Estin and Jacqueline Davis, Jack Leeney and Janine Sevighy, Mert Wallen, Junee Kirk, Wido Scheefer and Larry and Lily Niles. They first traveled to Austria’s largest ski resort, Ischgl, where they skied to Switzerland for lunch and came back on the world’s only two-storied aerial tram. They also had lunch in Innsbruck, Austria, at a most unique restaurant atop the ski jump.Then it was on to Cortina d’Ampezzo, the Aspen of Italy, that features a crazy caper – snow-rafting down the landing of the Olympic ski jump in rubber river rafts at 60 miles per hour. The finale was on to Venice to celebrate Carnival. Then everyone returned to Aspen in time to attend the Wine Party held on March 12 at Blondie’s Cabin on the Silver Bell ski trail on Aspen Mountain. Hosts were Bill Bindley, Jack Crawford, Ron Krajian, W.T. Ray, Walter Glass, Jack Cronin, Ruben Hedlund, Sid Hendricks, Don Crawford, Ed Peterson, Stephen Nardi, Peter Belsky, Jim Riley and Gene Reardon.On the eve of the Wine Party, the hosts took over the T-Lazy 7 for an evening of dining and Western dancing. Kent Reed, director of the Hudson Reed Ensemble, announces the ensemble’s performance of Arthur Miller’s “The Crucible” at the Black Box Theatre in Aspen High School on March 25, 26, 27 and April 1, 2, 3. “The Crucible: When good country people do bad things,” features a cast of 16 actors from the Roaring Fork Valley and launches the first of a series of classes in a workshop/performance format. Kent founded the Aspen Theatre in the Park in 1983 and after producing, acting in and directing numerous plays in Aspen, he left the valley in 1990 to pursue his acting career in Chicago. He worked there with the Goodman Theatre, Chicago Dramatists, and The Piven Theatre; he also worked in film, TV, industrial films and commercials. Kent recently returned to Aspen with the intention of developing and nurturing acting talent throughout the Roaring Fork Valley with his workshop/performance classes. And he plans to continue his acting career here. Tickets for “The Crucible” are $15 at the Wheeler Box Office or at the door.Had an e-mail from daughter Jess Bates (Hayes). After graduating from a two-year digital graphics school in Seattle, she has a job as an animator, artist and video-game developer with Handheld Games, which makes video games for Gameboy, cell phones and mobile devices. Husband Steven Bates (Solomon), is doing family and wedding videos. Son Tamas will go to college in the fall. He is considering Western Washington University in Bellington.Undercurrent … The skiers and snowboarders have raccoon eyes and sunburned faces.